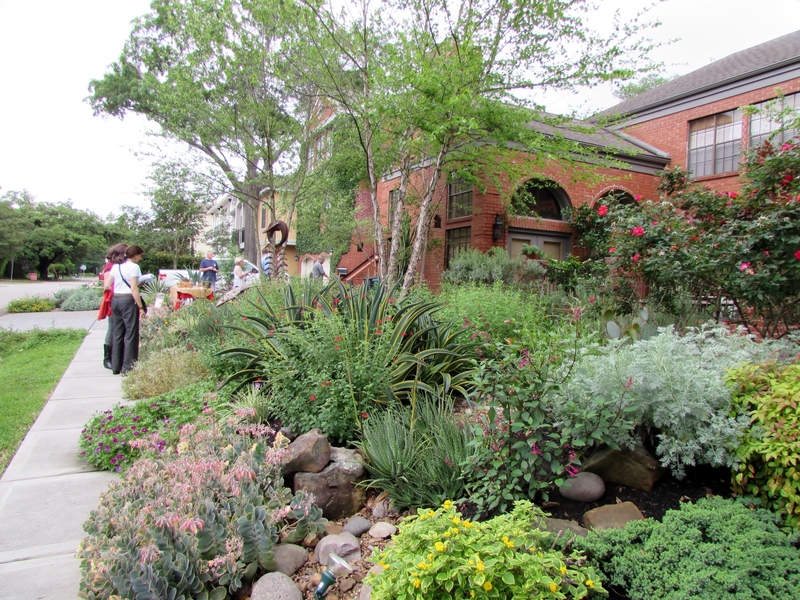 It was one of the many overcast days we’ve had this spring, with threat of rain, when the Garden Conservancy hosted their Open Days here in Houston. 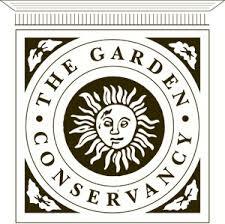 If you are not familiar with the Garden Conservancy I highly recommend checking them out and joining them on the next open days here in Houston. It has been a busy spring; this is only the second post on one of the six gardens we saw the middle of April. 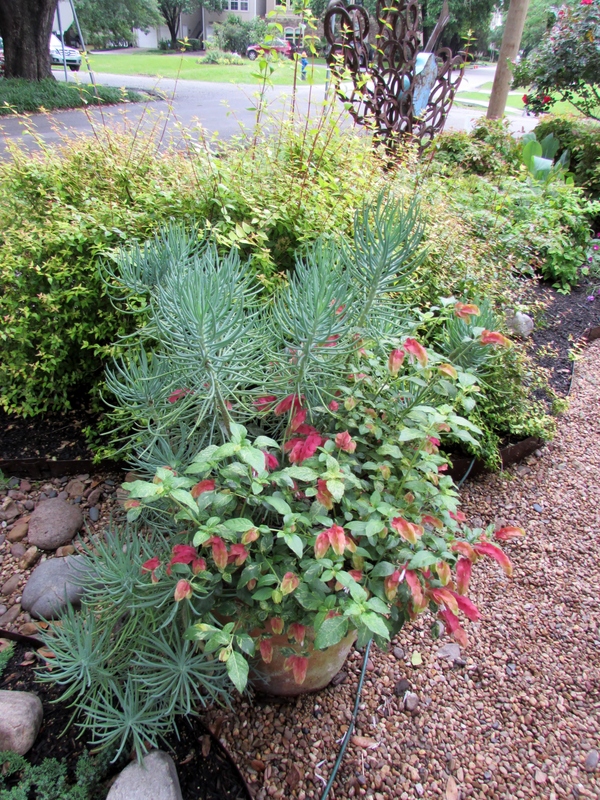 A fabulous Xeriscape garden designed to remind the owner of her childhood in Colorado and time living in Arizona. 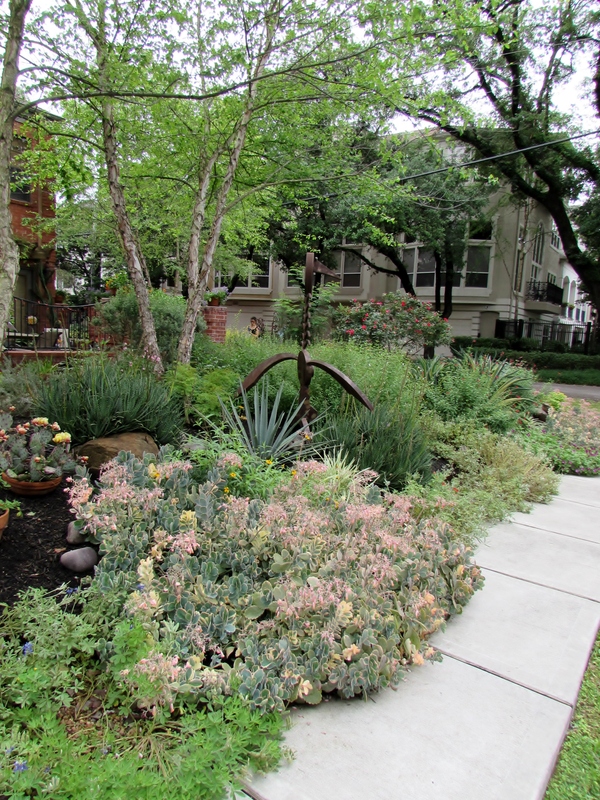 It is a mix of perennials, succulents and wildflowers. 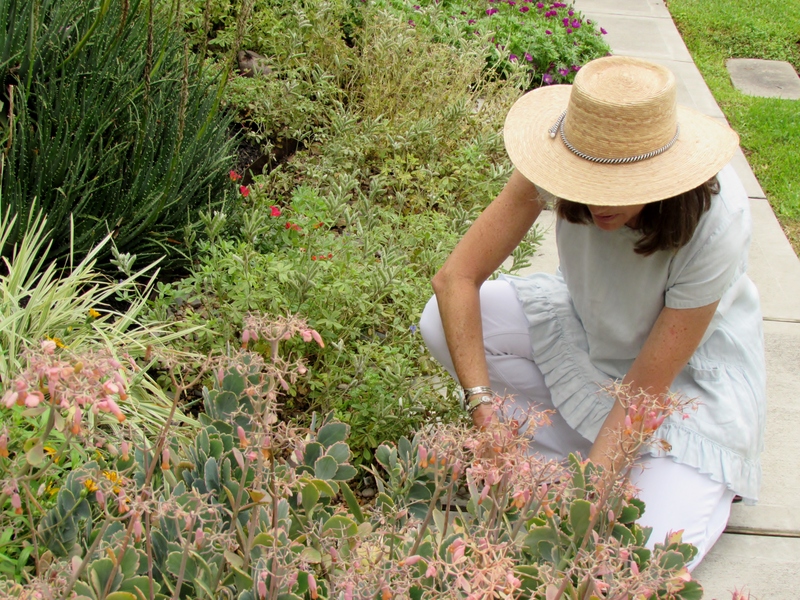 It is full of drought tolerant plants that need little augmented watering. We were told that only organic fertilizers and no chemicals are used in this garden. 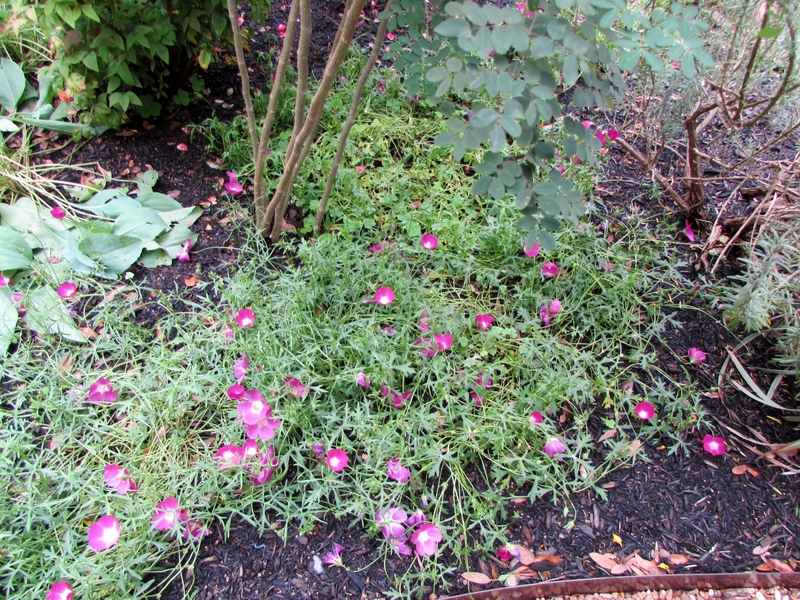 The plantings are meant to attracted birds, bees and butterflies! The townhome is on the corner surrounded by an open ditch, which is a common part of our city drainage system. Even though the property is well above the ditch, the owner created mounded beds with dirt and weed fabric (to help stabilize) and soil, with mulch covering the drip tubing for the middle plantings. 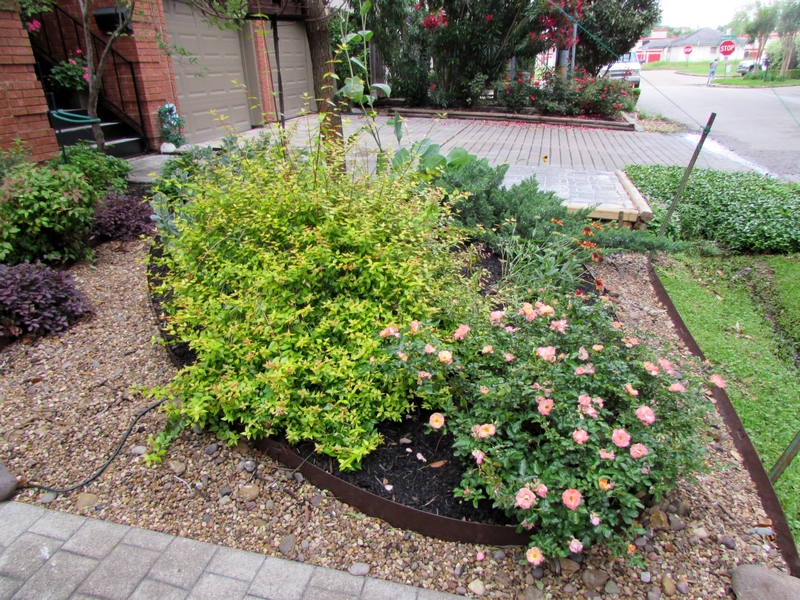 This bed is ringed by a bed that continues to slope to the sidewalks and these plants are planted right into the pea gravel. 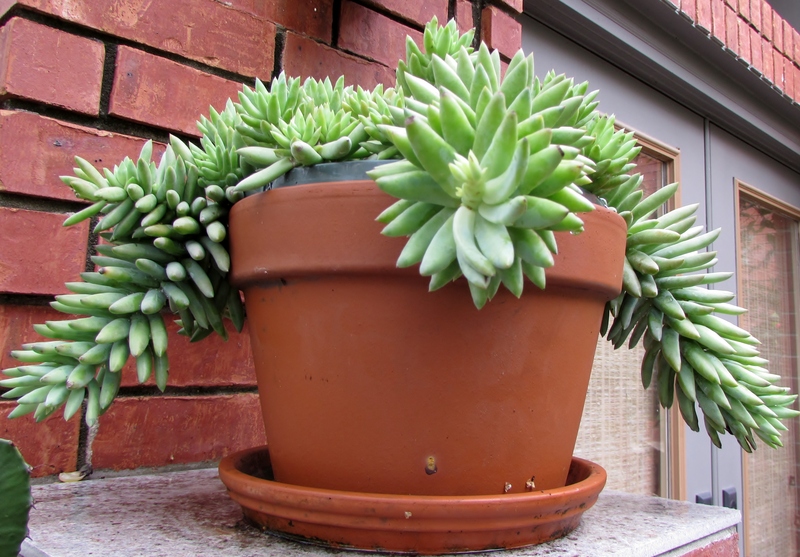 Most drought tolerant plants and succulents require good drainage. With our clay (gumbo) soil and nearly 50″ of rain we can turn to a swamp over night. If you live in Houston or have seen the news we had a very rainy May with lots of flooding. The Heights were I live got over 18″ of rain in the last month. Here is a closer look and you can see the mulch and gravel and change in elevation. 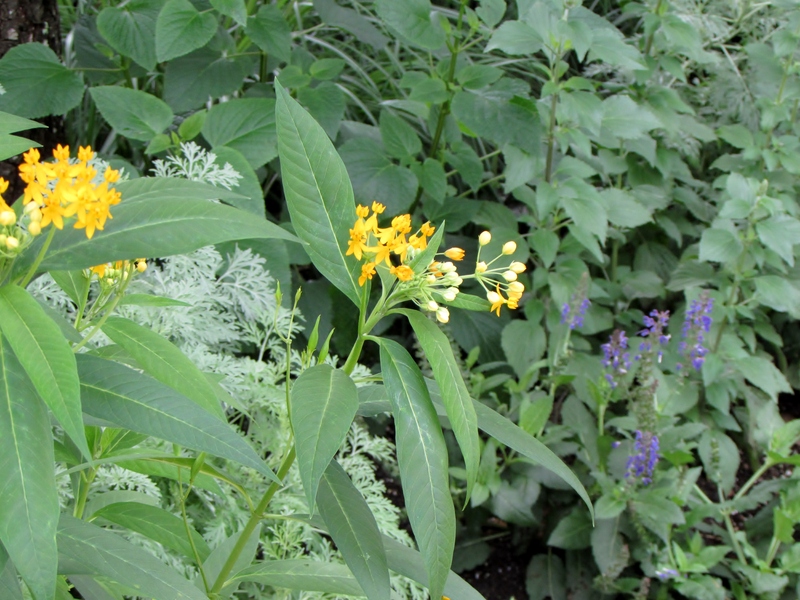 The bluebonnets were just finishing their blooms and the Butterfly weed and Mexican sedum were just starting. Clearly the Monarch caterpillars hadn’t found the delicious leave of the Butterfly weed yet. 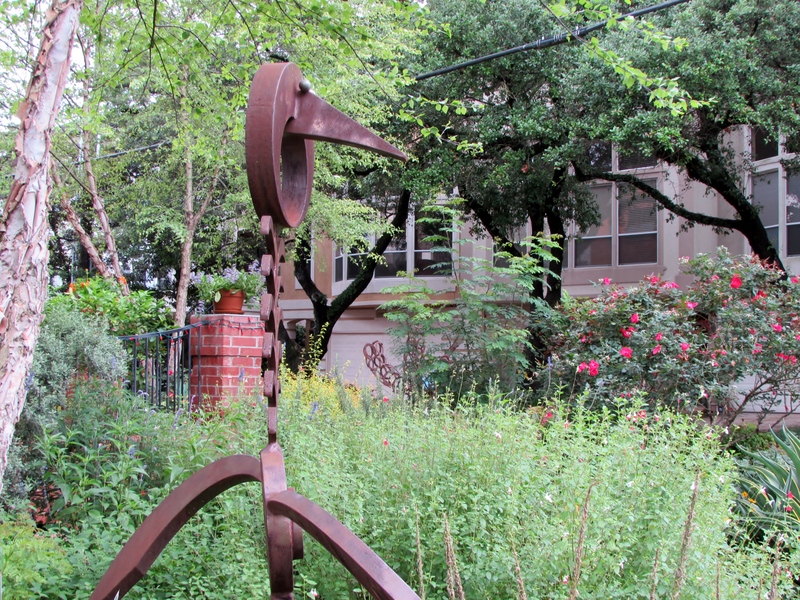 Art sculptures were wonderfully placed in among the plants and added to the appeal of this garden. I love the back drop of salvia greggi which always looks best in mass planting. There is much attention to layering in the design. A gravel path separates the raised islands from the patio. This allows you to view the garden from many angles and enjoy walking around the beds. The garden is really a series of vignettes that flow together. Here is the bed next to the front door. You can see the drainage ditch to your right in this photo. I am sure this helped during last weeks flooding. The Twist of Lime Abelia x grandiflora ‘Hopley’s’ seems very happy sharing a bed with drift roses. Peeking inside the courtyard that is surrounded by the lovely garden you find the southwest theme continues. 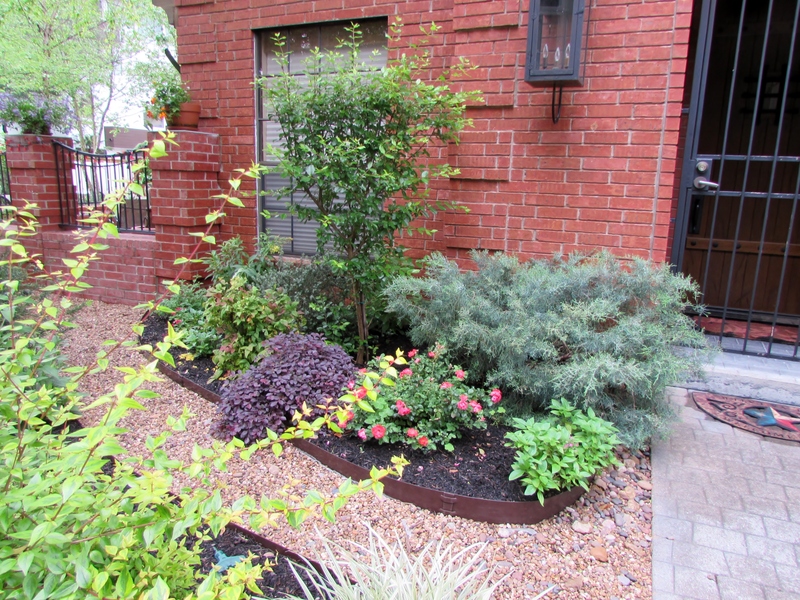 The outside plantings add privacy to this space. 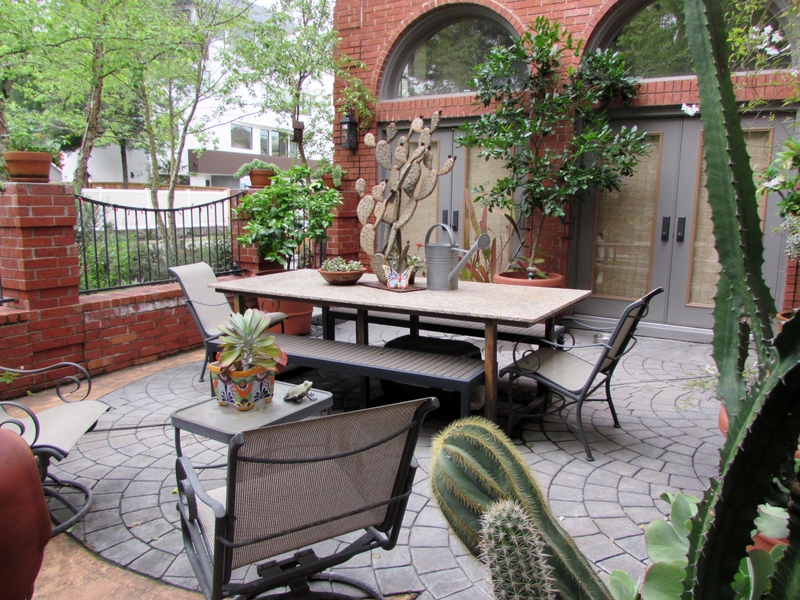 It is unusual to have such an open airy space in a townhome garden. 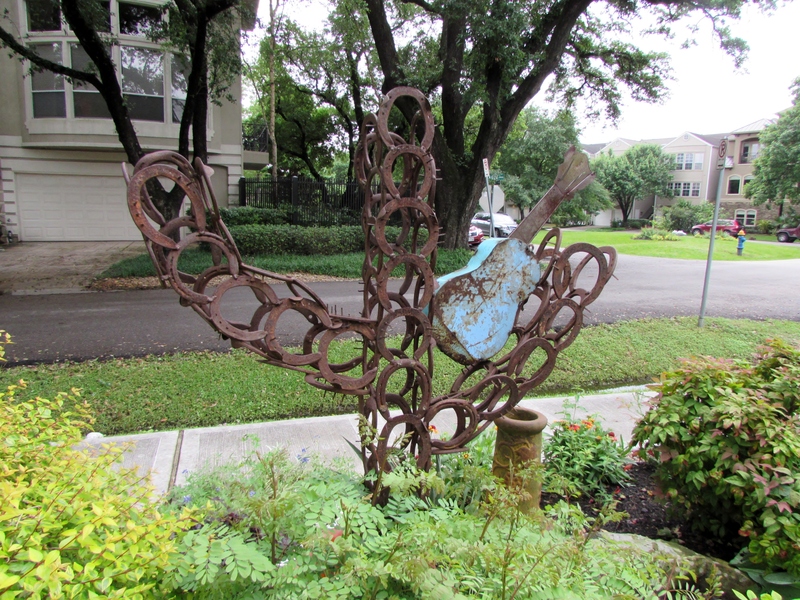 I loved the mix of fun sculptures and potted cacti and other plants. I found this garden comfortable and familiar being from the Southwest myself. 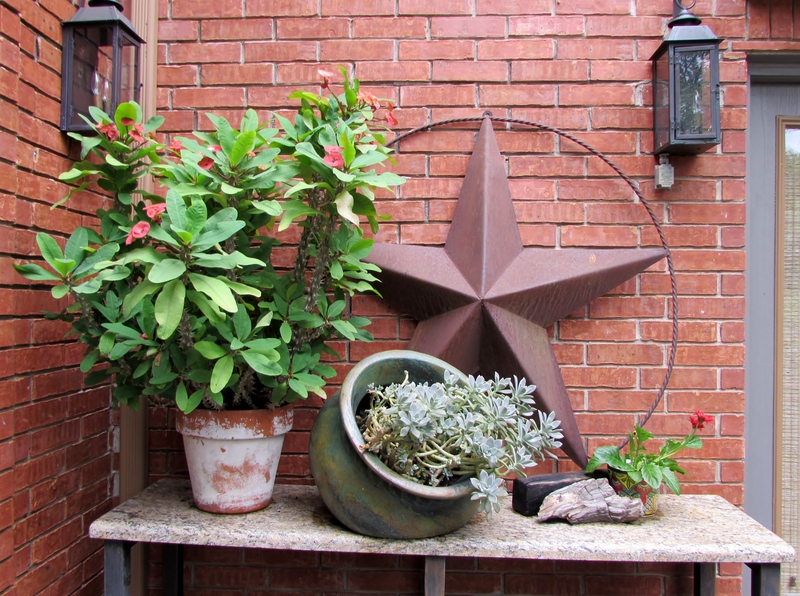 I like the combination of the big Texas star with the beautiful potted Crown of Thorns. Mine has been blooming well this year too! The brick columns are put to use as plant holders. 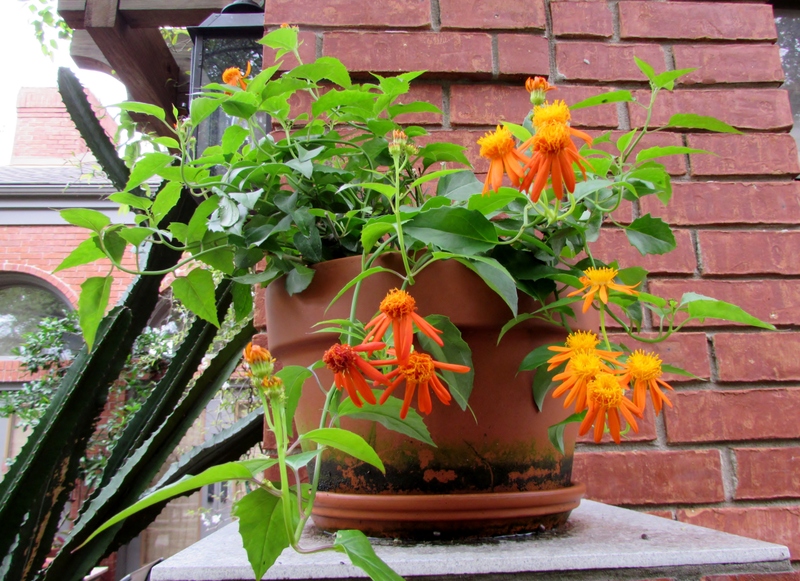 Mexican Flame vine, Senecio confusus is good for attracting Monarchs. It is a bit frost sensitive but this pot would be easy to move inside. Burro’s tail, Sedum morganianum, one of my favorite succulents. They do well in hanging baskets too! Back outside the courtyard we find more lovely vignettes with art, pottery and some mossy boulders. 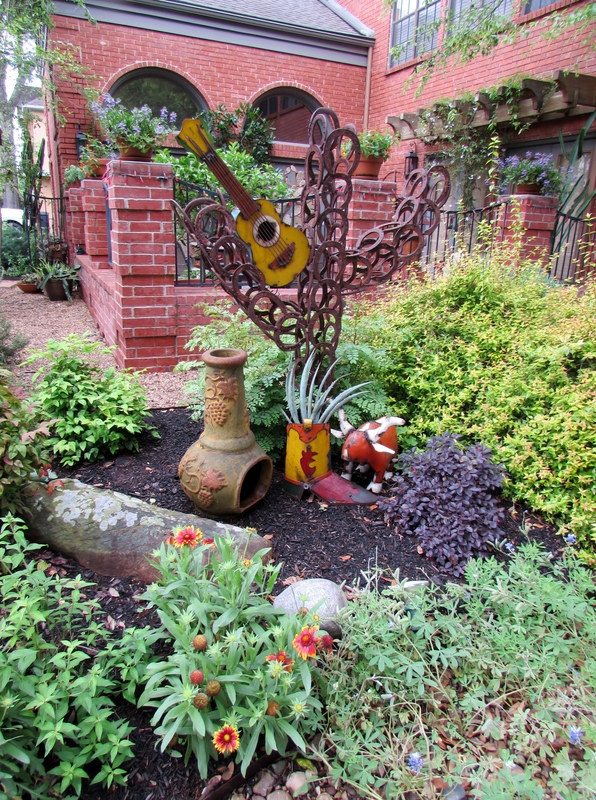 The horseshoe cactus sculpture seems to be playing the guitar and has a little friend, the metal bull, as a companion. The boot is a fun planter! 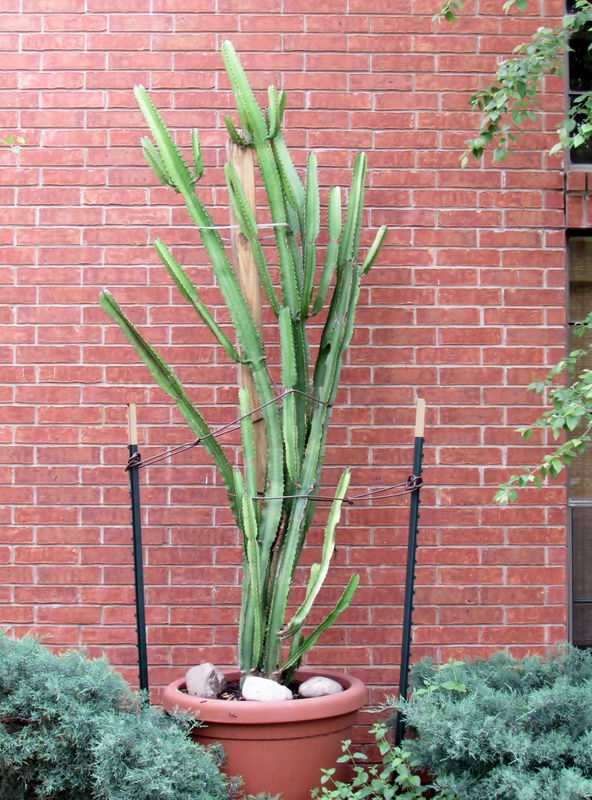 I have seen real boots planted with cactus or succulents that were fun. In the foreground are Indian Blanket also called Firewheels, Gaillardia pulchella. I have seen more of them this spring than during our drought. They must love the rain! Either it has gotten a bit top heavy or it must be restrained from attacking passers by. If an arm did break off they are very easy to root. Viewed from behind the horseshoe cactus you can see how open the space is to the street. We are facing south and even with big oaks across the street, on a sunny day this garden gets lots of sun. Around the corner facing west, with hot afternoon sun in the summer, you find succulents flowing over onto the sidewalk. The River birch are well placed to give light shade to the courtyard. 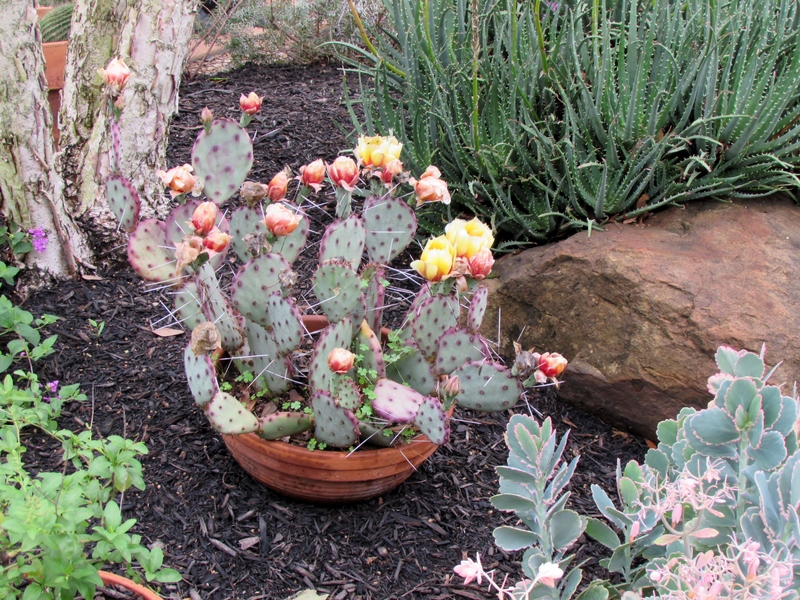 I think the cactus in the bowl is a Santa Rita Prickly Pear, Opuntia Santa-rita. And that is some happy Aloe in the background climbing over the rock. 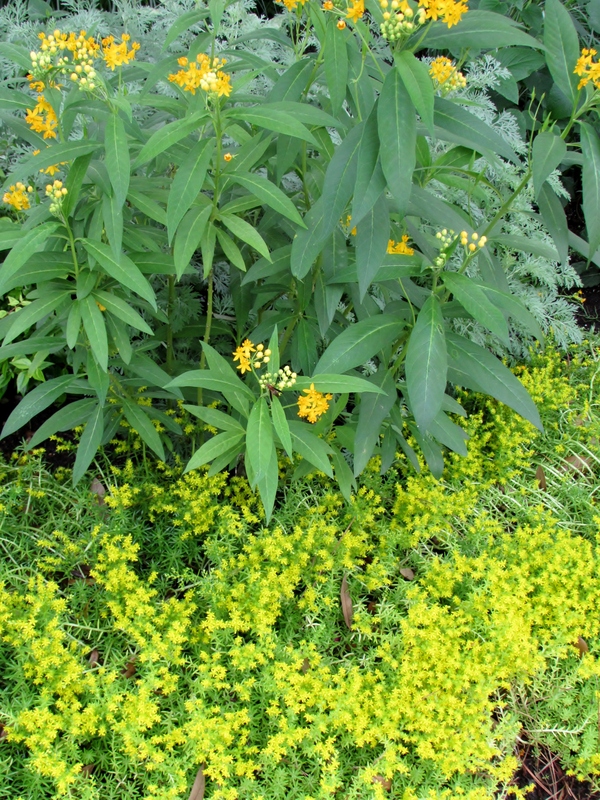 I enjoy the texture and shades of green in this vignette with just a bit of pop yellow from the flowers. The rough peeling bark of River birch adds to the high dessert feel of this garden. Closer view, the cactus is putting on a good show for us! Another appealing grouping of Senecio cylindricus (Narrow-Leaf Chalksticks) sharing a container with a with a Red Shrimp plant, Justicia brandegeana. Red Shrimp plants are very popular with butterflies and hummingbirds. The rich deep color of native Winecup it is very eye catching. 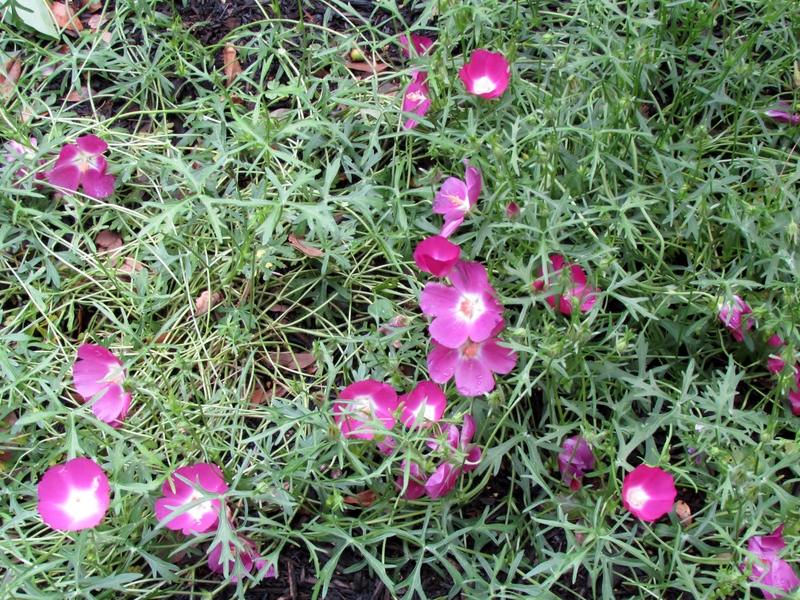 It is also know as Purple poppy mallow, Callirhoe involucrata. I am sure it will attract many pollinators. Close up! This part of the garden had been recently installed. 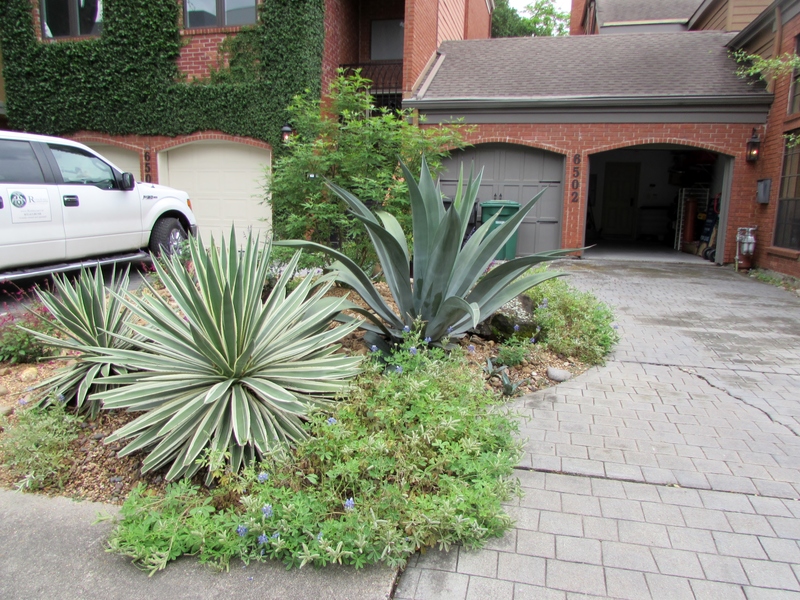 There is an Agave Americana and two Variegated Caribbean Agave (Agave angustifolia ‘Marginata’) with gravel, bigger rocks and Bluebonnets. I like the way the bed curves taking over part of the driveway space. 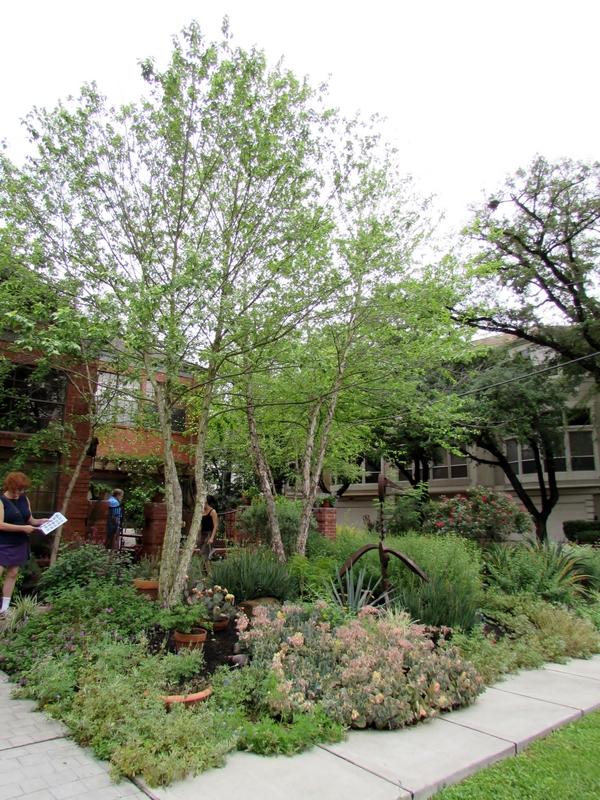 Here is Lori, the homeowner who created this beautiful garden. She was a very gracious host and even gave away cuttings of her Kalanchoe fedtschenkoi ‘Variegata’. I have my piece rooted in a pot on my porch. Happy Gardening! 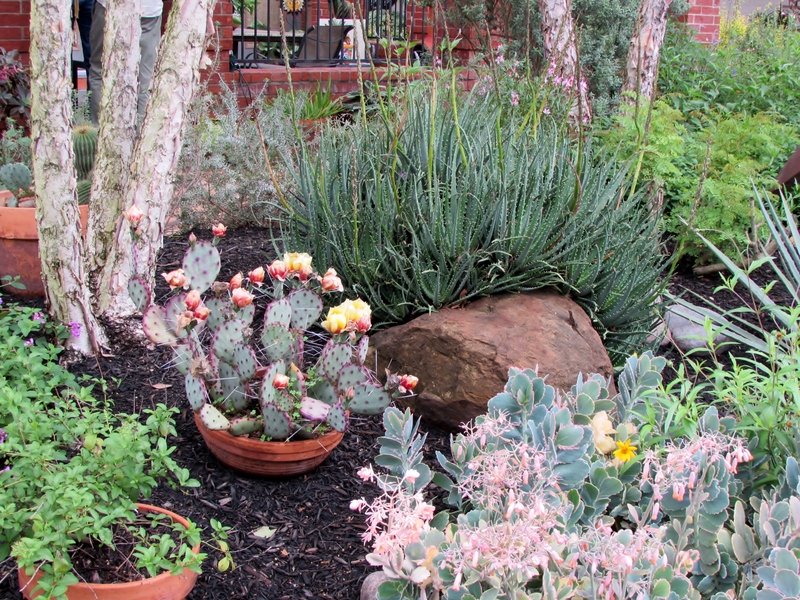 All that rain and the succulents and cactus look happy? Nice garden at the townhouse. I should send my succulents outside with all our dry weather, but weirdly, our temps dropped too. Donna, hopefully it is warmer now and your succulents can enjoy the summer outside. Lovely, lovely garden area and the art sculptures just add so much. The art does work well and really adds to the southwest theme. I need to drive by and see how it is doing after all our rain. Laurin, did you have an older blog that is now inactive? I got to here from Nature and Wildlife Pics in my comment above, but can’t get here from GWGT. It gives me an inactive blog. I always visit by the link left. You are in my reader and thru email, but out of habit or time savings, I click links on the post. It is good for others too because some use my blog to blog hop. I can always tell so I know the links are used often clicking to other blogs. Thank you Dee, it has been busy and we have made good progress on the business side of life. The rain has slowed us quite a bit but I am so happy that the aquifers are filling up. Summer is upon us so no more new plants here at Ravenscourt…and my pile of books is looking good! Laurin- I also saw this garden on the tour and it was my favorite because of how each plant was given enough space to be seen completely and how well they all fit together like pieces of a puzzle.